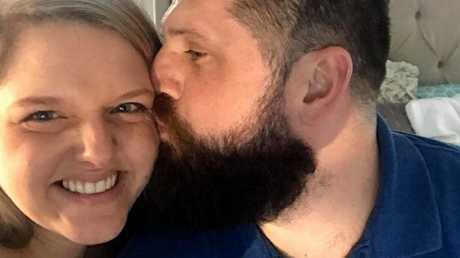 Stephanie Hollifield said a flight attendant made her feel better about flying with a fussy toddler. Picture: Momstrosity via Facebook. The mother of a two-year-old girl has posted an open letter online, addressing a fellow plane passenger who was clearly "annoyed" by her noisy toddler. 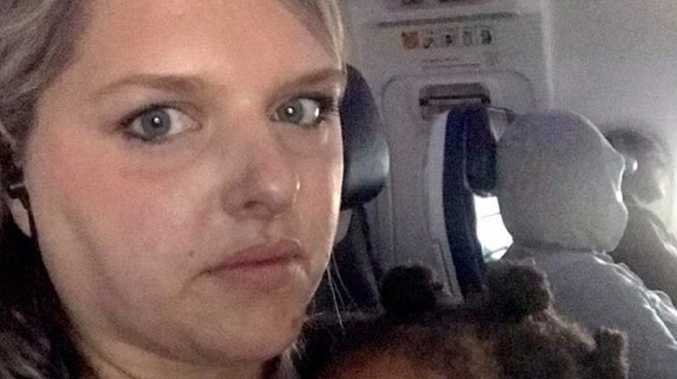 Stephanie Hollifield, 33, was on a flight with her daughter Haley, when a nearby passenger was heard sighing "loudly" and making "overdramatic huffs and puffs" throughout the journey. 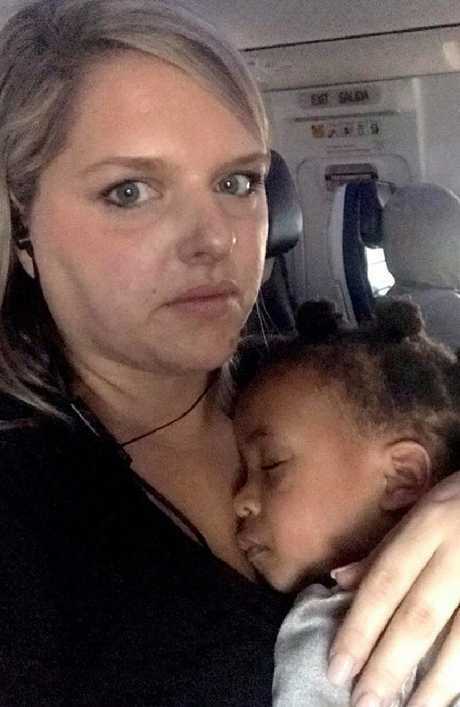 Ms Hollifield, who lives in the US and writes for a parenting blog, wrote in the letter that the man became annoyed when her daughter "was laughing and playing, obviously too loud" on board the plane. "To the Gentleman on Flight 1451," the post on Facebook began. "I first noticed you when you sighed loudly as you laid eyes on me and my toddler boarding the plane. In a momentary lapse of judgment, we sat behind you. It was the nearest set of seats, and I couldn't wait to put my child and our heavy bags down. "From the over dramatic huffs and puffs you let out as we buckled in, it was clear that you were annoyed by our very presence. "At this point, my little girl was laughing and playing, obviously too loud for your liking." Stephanie wrote in the post that she noticed a nearby passenger ‘sigh loudly’ and make ‘overdramatic huffs and puffs’. Ms Hollifield questioned in the letter if the angry passenger had "had a bad day" or if his "grouchy temperament was your normal behaviour". "I wondered if your wife was embarrassed as she quietly nodded at your frustrations," Ms Hollifield questioned. "Did you wonder about this mom and little girl who were flying alone? We were so excited to go on an adventure, but I was also very nervous. "This was the first time that I had ever flown with a child, and I was making half of the trip without my husband. For weeks, I researched tips for flying with kids. I packed toys and games and books and downloaded movies. "I did everything in my power to keep her calm and quiet. I shushed her, and made sure her little feet didn't kick your seat." Ms Hollifield said that after the plane took off, her daughter started to cry and that's when the tantrum started. "She had been up since early morning … She hadn't had a nap … She hadn't eaten much," the mother explained. "You did not let up with your mutters of annoyance and looks over your shoulder. I apologised to everyone around me. I almost started crying myself. "I was feeling shame and guilt for not being able to control my own child." The distressed mother said she was nearly at the end of her rope, when "an angel" came to the rescue. "The flight attendant came by and gave my daughter a cup and straw to play with," she explained. "And just like that, the screams stopped and my baby was suddenly content. "We were doing our best, and that's as great as it gets. "The problem wasn't with us, it was with you. What you need to know, is that while children can be terribly inconvenient now, they will run the world when you are old and grey. "These kids might one day discover the cure for the type of cancer that runs in your family. They can be selfish and loud, but they can also be precious and loving … They are the future." 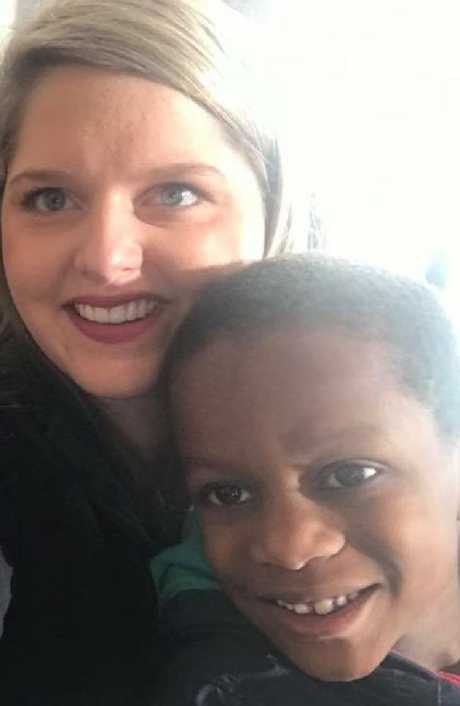 Ms Hollifield, whose post has received more than 2.5k likes, said next time the man is seated next to a distressed child, he should either "muster up a smile and a hello" or just sit in "silence". "I get it, kids can be a nuisance, but next time you are forced to be near one, I hope that you will be more like the flight attendant," she wrote. "I hope that instead of frustration and annoyance, you feel hope and goodness. "This world certainly has enough negativity without us adding to it, and just maybe the kindness you give out today, will be returned to you in the future." While most comments sympathised with Ms Hollifield, others questioned whether she could've done more to calm her child. This was the first time Stephanie had flown with her two-year-old daughter without her husband. "Next time, do not dose your child with Benadryl," one woman wrote. "Benadryl can have the opposite effect and can make them hyperactive." "This post seems pretty single sided," another added. "As a mother and a person with acute hearing I can relate to both being embarrassed and being annoyed by someone lets their kid cry on a flight. "Doing research on flying you should have known a little acknowledgment goes a long way." "I'm sorry but I have to respectfully disagree here," one commented. "We should ALL make an effort to do everything in our power to make it the least miserable process possible. Yes that may mean headphones for some, but just because children are our future doesn't mean you shouldn't do your job as mommy to prepare for the flight just like everyone else does theirs. "I know everyone is singing your praises but there's a middle ground here. 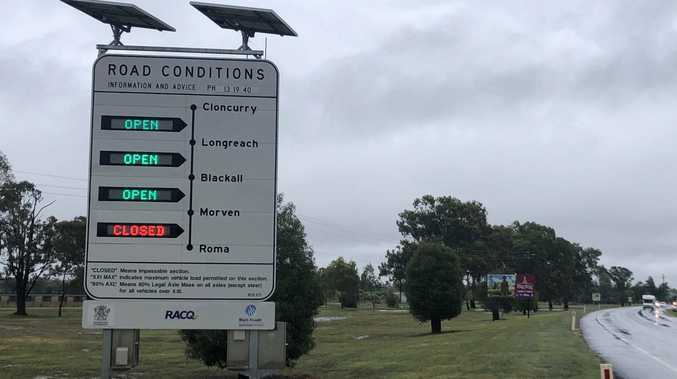 It's not 100 per cent on that person for being disturbed."